Distance sign heading west from Yarrangobilly Caves Rd (eastern junction). Feb 2006. Route taken: From the Princes Hwy via Snowy Mountains Hwy, Monaro Highway and Snowy Mountains Hwy to the Hume Highway. National Route 18 stretches 328km from the Princes Highway, 6km north of Bega, to the Hume Highway, 26km south of Gundagai, via the Snowy Mountains and Monaro Highways. Whilst the Snowy Mountains Highway, State Highway No. 4, follows much the same route as National Route 18, it has a gap of 46km, between 8km south of Nimmitabel and Cooma, where the Monaro Highway takes precedence. For the remainder of the journey, either side of the Monaro Highway, National Route 18 follows the Snowy Mountains Highway. 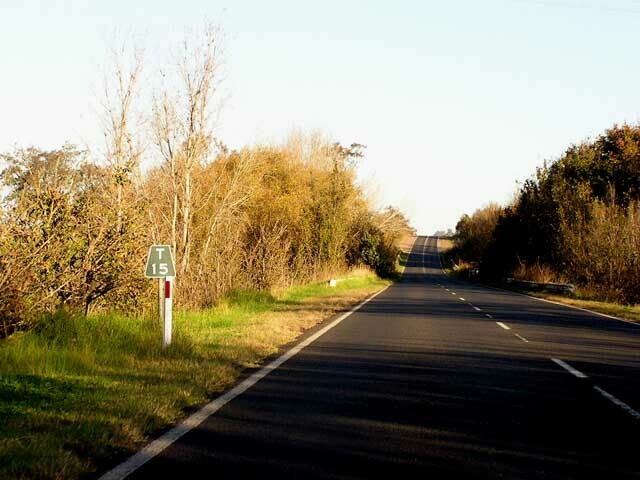 National Route 18 was included as part of the original 1950s NAASRA plan for the National Route marking system, hence its in-sequence location as an east-west route between National Route 16 (Murray Valley Hwy) and National Route (now Highway) 20 (Sturt Highway). Strangely, National Route 18 was signed largely before the route was sealed, which was against NAASRA recommendations for National Routes. NR18 signs appeared west of Cooma in 1958 and were installed east of Cooma in 1963. Interestingly, National Roue 18 is shown as signed as far east as Tathra in 1963, but subsequent NAASRA maps show the route terminating at the Princes Highway. Investigations in April 2004 revealed that National Route 18 was indeed signed east of Bega at some stage and there is a remnant NR18 shield at the old Snowy Mountains Highway's junction with Sapphire Coast Drive (albeit with a blank green sticker covering it). For more information on the Snowy Mountains Highway click here. First mention of Snowy Mountains Highway/National Route 18, southbound on Hume Highway. Feb 2006. Third northbound AD sign on Hume Highway, approaching the beginning of Snowy Mtns Hwy/National Route 18. Jan 2005. Unusual AD sign westbound on Snowy Mountains Hwy approaching the Hume Highway. Because of the low volume of traffic wishing to head towards Gundagai from the Snowy Mtns Hwy, it was decided not to build a direct overpass and traffic must enter the southbound highway before doing a u-turn several hundred metres to the south of the interchange. Jan 2005. Extremely rare (in NSW at least) END NR18 sign, with a more common END TD6 sign, on the ramp from Snowy Mtns Hwy to Hume Hwy southbound. Jan 2005. First distance sign on Snowy Mtns Highway, heading east from Hume Highway. Feb 2006. A supplemental distance sign, letting travellers know they should follow "Cooma" signs for access to the Snowfields. Feb 2006. Eastbound view of the typically undulating Snowy Mtns Hwy west of Adelong. Feb 2006. Reconstruction and widening underway at Nacka Nacka Creek (7km west of Adelong). Feb 2006. Unusual diagrammatic AD sign, eastbound as you enter Adelong. Feb 2006. Looking south along the main street of Adelong (Snowy Mtns Hwy), approaching Wondalga Rd. Feb 2006. Black distance sign heading east from Adelong. Feb 2006. Looking east, 15km from Tumut. Feb 2006. Northbound AD sign on Batlow Rd approaching Snowy Mtns Hwy near Gilmore. Feb 2006. Black distance sign, heading west from Tumut. Feb 2006. New AD sign in Tumut, approaching the junction with Gocup Rd. Very well designed, except for one thing - there is no NR18 shield! Feb 2006. Black AD sign on Gocup Rd southbound approaching Snowy Mtns Hwy. Note the lack of a NR18 shield on the bottom panel of the sign. Feb 2006. Very old black ID sign at the Gocup Rd junction in Tumut. It looks as though this was once a double-chevron ID sign but has been cut in half to suit a new location. This sign has since been replaced. Mar 2004. Black AD sign westbound approaching Gocup Rd. Feb 2006. Looking east along Snowy Mtns Hwy in Tumut. If you stick to the highway you don't see much of the town centre as it lies along Wynyard St, which may once have been part of the highway. Feb 2006. Distance sign heading east from Tumut. Feb 2006. Information sign warning travellers they should carry snow chains at all times during the winter months, as the Snowy Mtns Highway is prone to snowfall between Tumut and Adaminaby. Feb 2006. The highway is generally kept open all year with regular snow-plowing but extremely heavy snowfall can cause short-term closures. Because its still summer, this sign tells us that the road is open. Feb 2006. Lovely tree-lined section of the highway approaching the crossing of the Tumut River, 8km southeast of Tumut. Feb 2006. After crossing the Tumut River, the Snowy Mountains Highway gets very steep and winding as it ascends the Great Dividing Range. Also note the poor condition of the pavement. Feb 2006. Black kilometre plate heading east, showing 165km to Cooma. These are quite common still on the Snowy Mtns Hwy west of Kiandra. Feb 2006. The Great Dividing Range forms an imposing backdrop for this overpass across the highway near Blowering Dam. I'm not sure what the overpass is for, but it may serve traffic from the Blowering Dam. Feb 2006. Winding road and a large cutting, looking east between Tumut and Talbingo. Feb 2006. Looking south alongside Blowering Reservoir, a glimpse of which can be seen to the right of the highway. Feb 2006. A sign warning of the long distance between services as you approach the turnoff to Talbingo. Feb 2006. Distance sign heading east from Murray Jackson Dr (the access road from Snowy Mtns Hwy to Talbingo). Feb 2006. One of the straighter sections of the Snowy Mtns Hwy as you ascend the Cumberland Range east of Talbingo. Feb 2006. Midway between Talbingo and Yarrangobilly Caves the highway straightens out and yellow line-marking is introduced. This means we have reached the height where it regularly snows. Feb 2006. A few kilometres after the yellow line-marking begins, these orange poles begin lining the edge of the highway. They are used so that, in times of snowfall, you can see the edge of the road formation - the regular white posts can become very hard to see when surrounded by snow! Feb 2006. 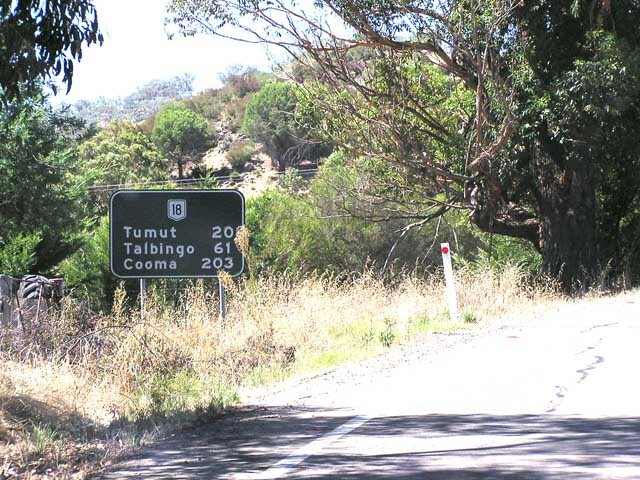 Sign denoting the crossing of the Cumberland Range between Talbingo and Yarrangobilly Caves. Feb 2006. Looking south-east across the Yarrangobilly River. Feb 2006. Unusual sign warning motorists of wild horses that may be crossing the highway for the next 3km, between Yarrangobilly River and Yarrangobilly Caves. Feb 2006. Black kilometre plate, heading southeast 115km from Cooma. Feb 2006. An old painted AD sign at the western junction with Main Road No. 324 (Yarrangobilly Caves access road). MR No. 324 is the original alignment of Snowy Mtns Hwy, replaced by a new route via Rules Point in November 1930. This sign has since been replaced. Mar 2004. Black distance sign heading east from the above junction. Feb 2006. Looking east across the plateau at Rules Point. This would be quite a scene in the winter months. Feb 2006. Distance sign heading west towards Rules Point from the eastern junction with Yarrangobilly Caves Rd. Feb 2006. A rather belated welcome to the Snowy Mountains (after nearly 80km of mountain climbing! ), 100km from Cooma. Feb 2006. Looking east at Kiandra, showing the junction with the Kiandra-Cabramurra-Khancoban road (Tourist Drives 1 & 5). Feb 2006. Black AD sign with no NR18 shield (!) approaching Snowy Mtns Hwy from the Kiandra-Cabramurra-Khancoban road. Feb 2006. Distance sign heading west from the above junction. The "town" of Kiandra is just ahead, although I couldn't see anything more than a snow plowing depot. Feb 2006. Gently curving section of the highway with wire-rope fencing on the outskirts of Kiandra. Feb 2006. Looking west at Kiandra with an old alignment (pre-1970s) of the highway on the left of the current route. The current route was constructed by the Department of Main Roads as part of a complete reconstruction of the highway between 1949 and 1973. Feb 2006. Another view of the old alignment, this time from the Kiandra-Cabramurra-Khancoban road. Note the old single-lane concrete bridge over Bullock Head Creek in the foreground. Feb 2006. 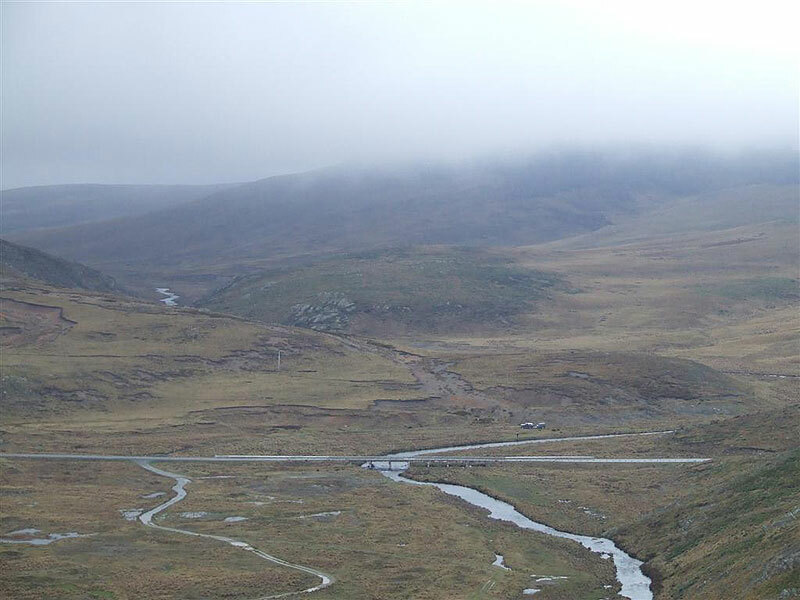 A long view, on a foggy day, of Snowy Mountains Highway crossing the Eucumbene River, east of Kiandra. Source: Rick Wardle, October 2008. Distance sign (missing a NR18 shield!) heading west from Kosciuszko Rd, 6km west of Cooma. Apr 2005. AD sign on Snowy Mtns Hwy eastbound, approaching Kosciuszko Rd. Traffic must turn here to continue on the SMH. Apr 2005. Distance sign heading east from Kosciuszko Rd towards Cooma. Apr 2005. Diagrammatic tourist AD sign heading west approaching the Kosciuszko Rd junction. Note that traffic must turn right to continue on the SMH, as the dominant traffic flow is typically between Cooma and Jindabyne. Apr 2005. Distance sign heading west from Cooma. Apr 2005. Looking west along Sharp Street (Snowy Mountains Hwy) in Cooma. Feb 2006. Monaro Hwy (Sharp St) southbound approaching Snowy Mtns Hwy in Cooma. Note the lack of a NR18 shield for left-turning traffic. Feb 2006. Unusual combination of Monaro Hwy & NR18 at the junction of Monaro Hwy & Snowy Mtns Hwy in Cooma. This sign should have a NR23 shield as well. Feb 2006. Monaro Hwy (Bombala St) heading west approaching the junction with Snowy Mtns Hwy in Cooma. Feb 2006. Very old black painted fingerboard at Campbell St in Cooma. 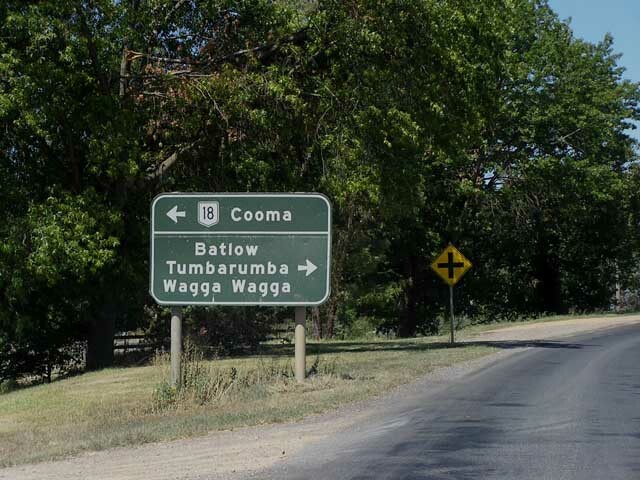 This sign probably outdates the extension of National Route 23 southwards from Cooma to Bombala and Cann River. Feb 2006. One of the very few correct signs on the NR18/23 duplex, this distance sign is heading east across the railway on Monaro Highway at Cooma. Feb 2006. Looking south at Rock Flat Creek, along a deviation constructed in 1962. Feb 2006. Distance sign heading northwest along the Monaro Highway from Nimmitabel. Note the lack of a NR18 shield. Apr 2005. Looking south through the township of Nimmitabel. Feb 2006. Black AD sign approaching the Monaro Hwy in Nimmitabel. Note the lack of a NR23 shield, as this sign probably outdates the extension of NR23 from Cooma to Bombala and Cann River. Apr 2005. Distance sign heading south from Nimmitabel on Monaro Hwy. Again, note the lack of a NR23 shield. Feb 2006. Distance sign heading north from the Monaro Hwy/Snowy Mtns Hwy junction, 10km south of Nimmitabel. This is the eastern end of the NR18/23 duplex. Feb 2006. Monaro Hwy eastbound approaching the beginning of the eastern section of Snowy Mtns Hwy, 8km south of Nimmitabel. Note the coverplates over alpha-numeric route markers - I wonder what number has been assigned to the southernmost section of the Monaro Hwy! Feb 2006. ID signage at the Monaro Hwy/Snowy Mtns Hwy junction. Only the right sign is correct, the left sign is missing a NR18 shield and the top sign is missing a NR23 shield. Feb 2006. Distance sign heading east from the Monaro Highway towards Brown Mountain. Feb 2006. Looking west between Monaro Hwy and Brown Mountain. The wire mesh fancing with wooden posts give this section of the Snowy Mountains Highway a very 1950s feel. Feb 2006. The calm before the storm - steam rising off the Snowy Mountains Highway at the top of Brown Mountain, just before we encountered some torrential rain. Feb 2006. The beginning of the steep and winding 11km section of the Snowy Mountains Highway where it descends from the Monaro Plains to the coastal plains. Feb 2006. Looking east at Brown Mountain. Feb 2006. Distance sign heading west from Bemboka in the rain. Feb 2006. Looking west from Bemboka with Brown Mountain in the distance. Feb 2006. Looking east, east of Bemboka with more wire-mesh fencing. Apr 2005. Looking east, 30km west of Bega. Apr 2005. Looking east to the narrow bridge across the Bega River at Morans Crossing. Apr 2005. Looking east about 8km west of the Princes Highway, showing how the Snowy Mtns Hwy winds its way through the hilly farmland of the coastal plain. Apr 2005. 1950s wooden & wire mesh fencing on a section of the highway cut into the hillside, near the Princes Hwy junction. Apr 2005. Distance sign, the first one on National Route 18/Snowy Mtns Hwy, heading west from the Princes Hwy, 7km north of Bega. Feb 2006. AD sign approaching the junction with Princes Highway, 6km north of Bega. This is the eastern terminus of National Route 18. AD sign southbound on Princes Highway approaching the junction with Snowy Mountains Highway, 6km north of Bega. Princes Hwy (Carp St) heading east in Bega, approaching the junction with Main Road No. 272 (old Snowy Mtns Hwy). Note the "Snowy Mtns Hwy" nameplate, which is a good indication that Main Road No. 272 was once part of the highway. Apr 2005. Distance sign heading east on Carp Street from the Princes Hwy junction. No such like finding a NR18 shield or Snowy Mtns Hwy name-plate this time. Apr 2005. Relic from the days when Main Road No. 272 (Bega-Tathra road) was part of the Snowy Mountains Hwy - this black kilometre plate tells us that Tathra is 15km away. Apr 2005. Old timber beam bridge (built in 1937) and old 1970s sign at Meakers Gully. Apr 2005. Another timber beam bridge, this time over Gowing Creek (also built in 1937) and a 1970s creek sign. Apr 2005. Looking east just after a winding section of road, about 7km west of Tathra. Apr 2005. Double-chevron ID sign at Sapphire Coast Way with a NR18 shield underneath a green patch. You can just make out the outline of the shield from this photo. Apr 2005. Looking east at Evans Hill, 4km west of Tathra. Apr 2005. Looking east through Tathra - the town centre is at the top of the hill in the distance. Feb 2006. A view of Tathra Street (part of Snowy Mtns Hwy until 1976) as it descends towards the wharf. Feb 2006.